On Saturday morning, Tiddler went to Dramabuds with daddy, and the big three played while I did some housework. In the afternoon, there were two birthday parties, a real one and a pretend one, and some Maxi Hama beading. 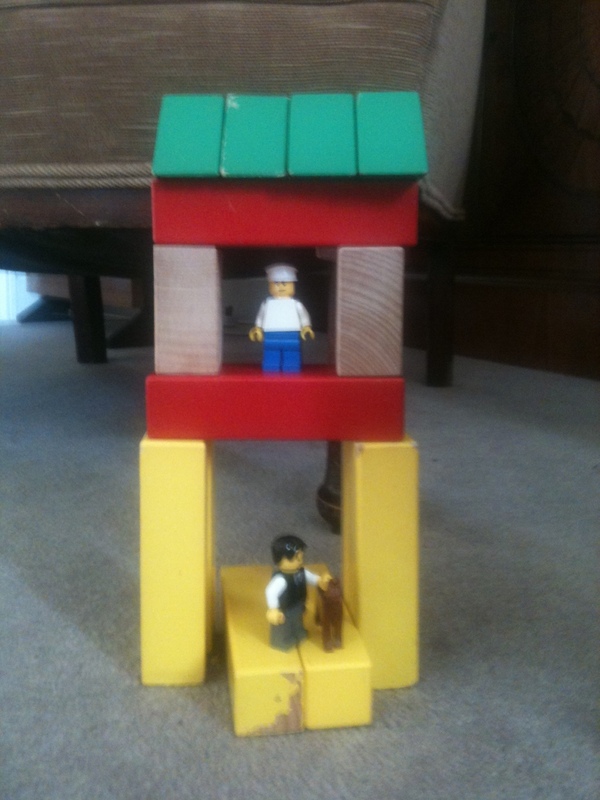 On Sunday, Owl and Tiddler went to church with daddy, while Rabbit and I tidied and hoovered – I’m not sure what Monkey was up to, but he was quiet. In the afternoon, we did more housework (it seems to expand to fill the weekend), and after tidying their bedrooms the children had some computer time. We had supper at Granny’s house, and then the big three made the Christmas pudding with daddy, while I tried to get Tiddler settled to go to sleep. On Monday, we did some Maths in the morning, starting with some workbooks (Owl – adding hundreds, Monkey – 3x table and area, Rabbit – counting and writing numbers) and finishing by playing Yahtzee. Then we did a little bit of English (Owl and Monkey – spelling, Rabbit – writing practice), and then some work on the computer – the addition trainer on Maths is Fun, and Reading Eggs. After a bit of playtime, Owl did some Science work on fossils, and Monkey started a bar chart about how many hours sleep he has this week (from his Science book). In the afternoon, I went Christmas shopping while Supergirl looked after the children. They played, had some more time on the computer and watched a Lego DVD they borrowed from their friends. On Tuesday, the boys and I went to the Greenwich Observatory, while Rabbit stayed at home with Supergirl and went to her Dramabuds lesson in the afternoon. On Wednesday, we did some Maths in the morning, starting with workbooks (Owl – adding 9 and 99, and Monkey – 3x table and something else I can’t remember) and ending up with the Maths is Fun website. Owl discovered the chess game on there and spent a long time playing it. He also wrote his blog post about his sleepover. In the afternoon we went by bus to our friends’ house for Home Ed group. On Thursday, I took Tiddler for his swimming lesson, and then later Supergirl took Rabbit for hers. The boys spent part of the morning with our friend who is a childminder, and as always they had a lovely time with her. 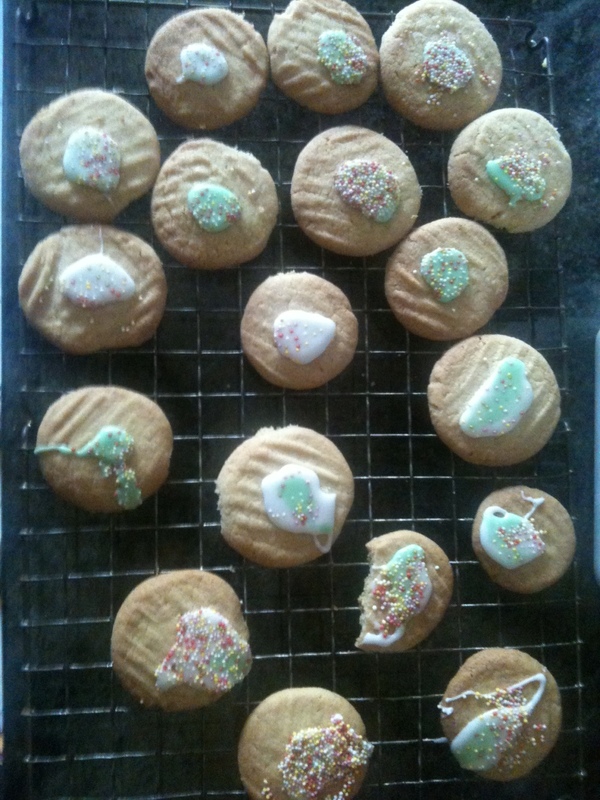 In the afternoon, the little two went shopping with Granny and then went to her house to make cakes, while I took the big to another Home Ed group. It was nice to see our friends there, but Monkey wasn’t feeling well and spent most of the time sitting on his own or on my knee. In the evening, Owl went to cubs. This morning, Supergirl took Rabbit and Tiddler to Musicbox while I had a quiet morning with the big boys. Today it was my turn to be ill (well this is nothing new, but I felt quite a lot worse today) so we spent part of the time in my bed doing puzzle books, and then Monkey disappeared off to do some Very Secret Making. When the little ones got back, they had a good time playing with Supergirl, and made a tree house out of chairs, cushions and blankets. At least I have been informed it is a tree house. I’m not sure that’s how it started out, but that’s what it is now. The boys did some Science, and some music practice, and apart from that they spent the rest of the day playing and watching television, as I wasn’t feeling well enough to initiate anything else. If the scene of devastation in the play room is anything to go by, they had a very good time! 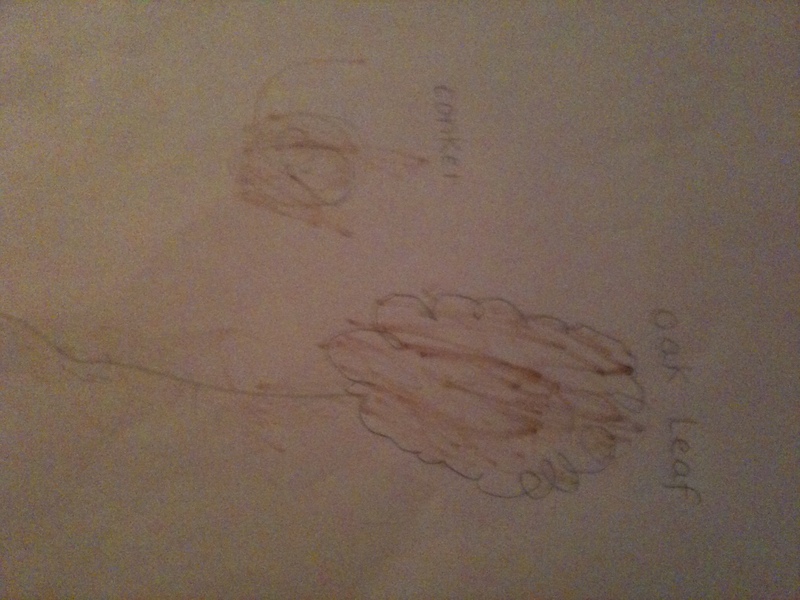 This entry was posted in Home education and tagged weekly round up on November 30, 2012 by Hannah. I’ve had a week of sleepless nights and it’s very late now so I might have forgotten some things, but this is what we’ve been up to this week. On Saturday I had a particularly bad night (it was getting light before I even fell asleep) so on Sunday morning I had a lie in, while Suburban dad took all all the children to church. I was very grateful and I made the most of it. I slept from around half past nine until ten to midday. It was a bit like being a student again. Granny (Suburban dad’s mum) came round for lunch and we had roast pheasant which was delicious (and cheap, which was why we had it.) The afternoon was mostly spent on housework, while the children played and had stories with Granny. We had another go at learning to use our new sewing machine, and managed to make two lavender bags. On Monday the children did Maths and English (the big three), piano lessons and Bible reading, piano and violin practice (Owl and Monkey), made a car out of chairs (the little three with Supergirl) and helped to cook pasta with pesto (Owl). On Tuesday Owl and Monkey went shopping with Granny while Supergirl and I took the little ones to Toddler group. In the afternoon the children did Maths, English and music practice and lots of reading. On Wednesday, Owl spent a lot of time engrossed in a Horrible Geography book about weather, as well as doing some Maths and English with Monkey and Rabbit. Granny (my mum) came for lunch and took Owl to London overnight. He enjoyed staying at the flat with Granny and Grandpa, visiting the Museum of Childhood and the Transport Museum and especially going to the Lego shop! He also did some very good writing while he was there and I think he is planning to finish it and put it on here (if we get round to it.) The rest of us went to Home Ed group on Wednesday afternoon, where the little ones and I enjoyed meeting some new friends, playing/ chatting and doing some lovely craft activities (making pictures out of lentils and seeds on sackcloth, and salt dough candle holders.) Monkey didn’t join in much as he was feeling ill again, and just wanted to go home. He wasn’t up to going to Beavers so we had a nice quiet table time before bed with all the little three doing sticker/ colouring/ activity books together. On Thursday, Rabbit went to our childminder’s house – she is a friend from church and going there is an occasional treat for the children, and they are always asking when they can go. Rabbit had a lovely time there as always, then went to her swimming lesson with Supergirl. Monkey did lots of drawing in his “oodles of doodles” book and Tiddler did some of his Diggers and Christmas sticker books. Rabbit did magic painting, a 3rd and bird sticker book, and her “nursery activity book” which she chose at the bookshop last week and has been working on a lot since then. 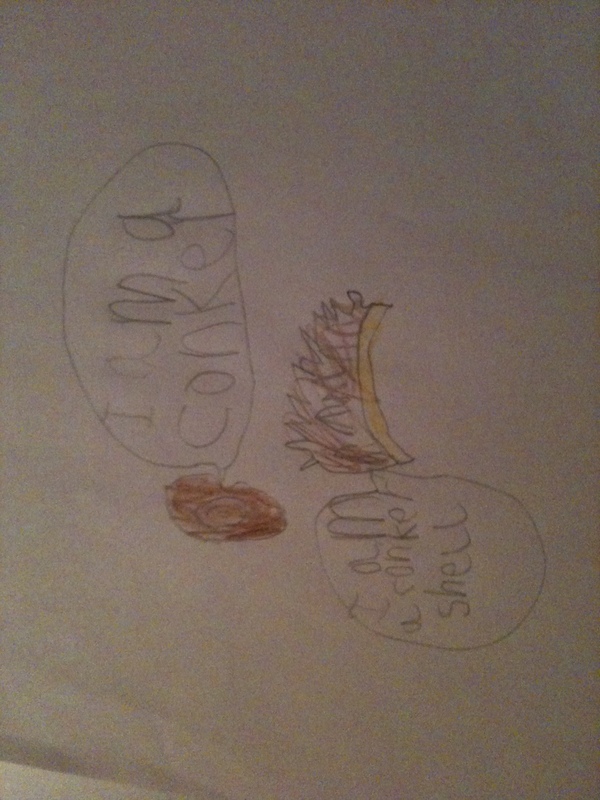 Monkey did some of his Beavers Christmas worksheet. Owl and Granny came back from London, and Owl did some Science research about rocks, while the little three played with the Lego Duplo railway. Today, Owl went to his violin lesson, but Monkey stayed at home because he was not well. The little three made a den in the playroom with Supergirl, then Owl, Monkey and Rabbit did some Maths and English. We then had a doctor’s appointment for the three younger ones which took up the rest of the morning. In the afternoon, while the little three were playing, Owl and I got into my bed and read the section about fossils in his Science book. He then spent the rest of the afternoon digging fossils out of plaster of paris (a kit which I’d forgotten he had from the Natural History Museum.) The week has had its ups and downs, but I thought it had ended quite well, with a good home cooked supper, daddy home in time to eat with us, computer time, bedtime stories and the children settled easily, if late. However, a very short time later Rabbit was sick in her bed and has been in our bed since. She is still coughing a lot and it looks like it will be another disturbed night. 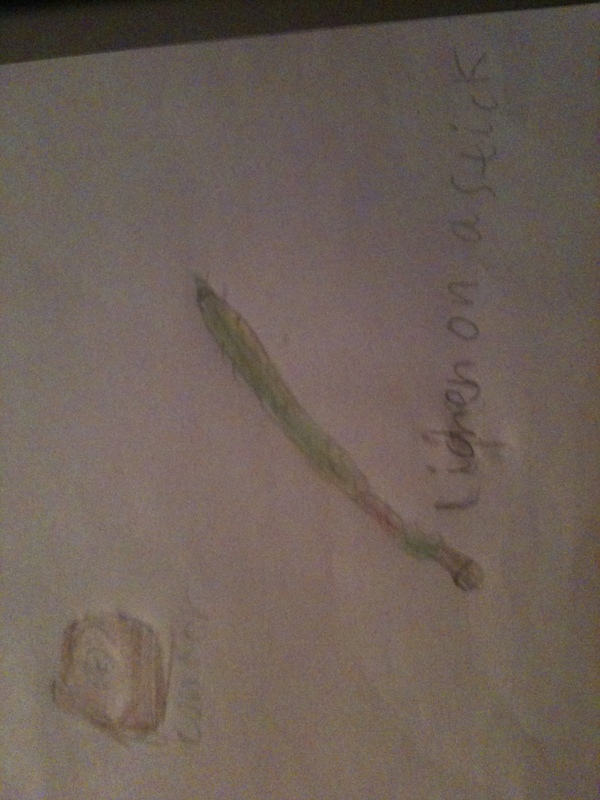 This entry was posted in Home education and tagged weekly round up on November 24, 2012 by Hannah.